In this knowledgebase article we will focus on the evolution and development of various generations of mobile wireless technology along with their significance and advantages of one over the other. In the past few decades, mobile wireless technologies have experience 4 or 5 generations of technology revolution and evolution, namely from 0G to 4G. Current research in mobile wireless technology concentrates on advance implementation of 4G technology and 5G technology. Currently 5G termis not officially used. 0G refers to pre-cell phone mobile telephony technology, such as radio telephones that some had in cars before the advent of cell phones. Mobile radio telephone systems preceded moderncellular mobile telephony technology. Since they were the predecessors of the first generation ofcellulartelephones, these systems are called 0G (zero generation) systems. The main technological development that distinguished the First Generation mobile phones from the previous generation was the use of multiple cell sites, and the ability to transfer calls from one site to the next as the user travelled between cells during a conversation. The first commercially automated cellular network (the 1G generations) was launched in Japan by NTT in 1979. In 1984, Bell Labs developed modern commercial cellular technology, which employed multiple, centrally controlled base stations (cell sites), each providing service to a small area (a cell). The cell sites would be set up such that cells partially overlapped. In a cellular system, a signal between a base station (cell site) and a terminal (phone) only need be strong enough to reach between the two, so the same channel can be used simultaneously for separate conversations in different cells. As the system expanded and neared capacity, the ability to reduce transmission power allowed new cells to be added, resulting in more, smaller cells and thus more capacity. In the 1990s, the 'second generation' (2G) mobile phone systems emerged, primarily using theGSM standard. These 2G phone systems differed from the previous generation in their use of digital transmission instead of analog transmission, and also by the introduction of advanced and fast phone-to-network signaling. The rise in mobile phone usage as a result of 2G was explosive and this era also saw the advent of prepaid mobile phones. The second generation introduced a new variant to communication, as SMS text messaging became possible, initially on GSM networks and eventually on all digital networks. Soon SMS became the communication method of preference for the youth. Today in many advanced markets the general public prefers sending text messages to placing voice calls. Some benefits of 2G were Digital signals require consume less battery power, so it helps mobile batteries to last long. Digital coding improves the voice clarity and reduces noise in the line. Digital signals are considered environment friendly. Digital encryption has provided secrecy and safety to the data and voice calls. The use of 2G technology requires strong digital signals to help mobile phones work properly. “2.5G” using GPRS (General Packet Radio Service) technology is a cellular wireless technology developed in between its predecessor, 2G, and its successor, 3G. GPRS could provide data rates from 56 kbit/s up to 115 kbit/s. It can be used for services such as Wireless Application Protocol (WAP) access, Multimedia Messaging Service (MMS), and for Internet communication services such as email and World Wide Web access. 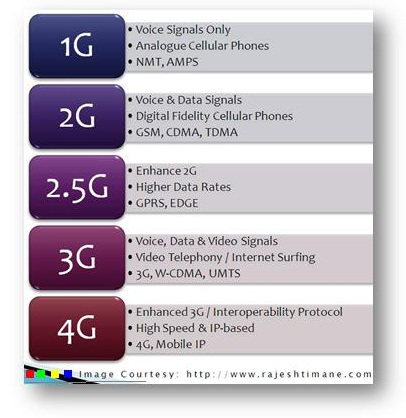 2.75 – EDGE is an abbreviation for Enhanced Data rates for GSM Evolution. EDGE technology is an extended version of GSM. It allows the clear and fast transmission of data and information up to 384kbit/s speed. As the use of 2G phones became more widespread and people began to use mobile phones in their daily lives, it became clear that demand for data services (such as access to the internet) was growing. Furthermore, if the experience from fixed broadband services was anything to go by, there would also be a demand for ever greater data speeds. The 2G technology was nowhere near up to the job, so the industry began to work on the next generation of technology known as 3G. The main technological difference that distinguishes 3G technology from 2G technology is the use of packet switching rather than circuit switching for data transmission. The high connection speeds of 3G technology enabled a transformation in the industry: for the first time, media streaming of radio and even televisioncontent to 3G handsets became possible. In the mid 2000s an evolution of 3G technology begun to be implemented, namely High-Speed Downlink Packet Access (HSDPA). It is an enhanced 3Gmobile telephony communications protocol in the High-Speed Packet Access (HSPA) family, also coined 3.5G, 3G+ or turbo 3G, which allows networks based on Universal Mobile Telecommunications System (UMTS) to have higher data transfer speeds and capacity. Current HSDPA deployments support down-link speeds of 1.8, 3.6, 7.2 and 14.0 Mbit/s. Further speed increases are available with HSPA+, which provides speeds of up to 42 Mbit/s downlink and 84 Mbit/s with Release 9 of the 3GPP standards. Consequently, the industry began looking to data-optimized 4th-generation technologies, with the promise of speed improvements up to 10-fold over existing 3G technologies. It is basically the extension in the 3G technology with more bandwidth and services offers in the 3G. The expectation for the 4G technology is basically the high quality audio/video streaming over end to end Internet Protocol.The first two commercially available technologies billed as 4G were the WiMAX standard and the LTE standard, first offered in Scandinavia by TeliaSonera. One of the main ways in which 4G differed technologically from 3G was in its elimination of circuit switching, instead employing an all-IP network. Thus, 4G ushered in a treatment of voice calls just like any other type of streaming audio media, utilizing packet switching overinternet, LAN or WAN networks via VoIP. 4G LTE data transfer speed can reach peak download 100 Mbit/s, peak upload 50 Mbit/s, WiMAX offers peak data rates of 128 Mbit/s downlink and 56 Mbit/s uplink.